There is no shortage of hype surrounding Intel's Developer Forum this year. Bay Trail chips are expected to smash the notion that Atom chips are slow and bring new possibilities to mobile devices. The new SoCs are here, and they are everything Intel promised. The Atom Z3000 or Bay Trail T series is meant for tablets and convertibles (both Android and Windows). The new chips offer up to 2x the CPU performance and up to 3x the GPU performance of the previous generation of Atoms all while maintaining the same low power requirements and heat generation. The top model – the Z3770 - supports display resolutions up to 2560 x 1600 and features Intel® Burst Technology 2.0 with four cores, speeds up to 2.4 GHz, four threads, and a 2MB L2 cache. 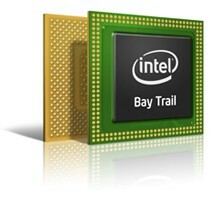 The RAM cap for these higher end Bay Trail chips has also be increased to 4 GB. 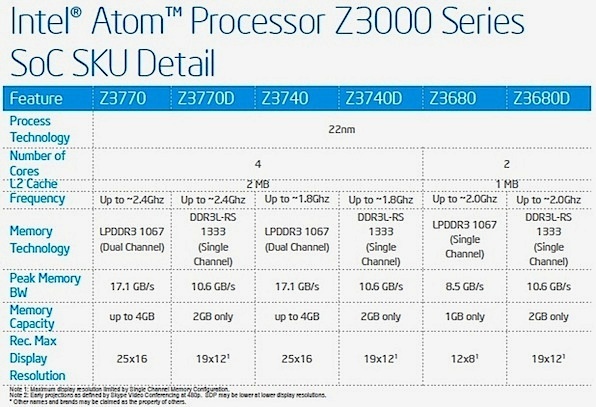 Intel is expecting tablets based on the Z3000 series to fit into the 7-11.6-inch range, weigh as little as 1 pound, be as thin as 8 mm (0.3 inches), offer 10 hours of battery life, and still sell for as little as US$199. The chips will start shipping to OEMs (including AAVA, Acer, ASUS, Dell, Lenovo, and Toshiba) in Q4 of this year.